If we really want to look for structural, technical reasons for a distinguishing characteristic that sets these two bands apart, it would be the Sardinian’s natural sense of melody and sense of cohesion throughout his compositions. This is the tactful use of elongaged, thematic melodies by Infamous, lending the music an air of great eloquence. Not only that, but in Infamous there is a sense of firmness and solidity provided by an elaborate use of the main theme as motific material for different sections throughout the song. What and how Infamous is distinguished from Gorrenje is, in part but not wholly, a question of refinement. Nevertheless, that is not to say that there is no value in Gorrenje’s music, and in the context of the split, its faster and more juvenile spirit serves to prepare the listener for the more paused, grand, flowing set of songs by Infamous. However, what ultimately sets Infamous apart from more or less every other black metal act active at this point cannot be captured with reference to clever songwriting, beautiful sonorities or a gratifyingly feral aesthetic. The quintessential power of S.A.’s work, ever present since the band’s inception, stems from an exceptionally strong affective impact. This is fiercely passionate music that, like all great black metal, transcends personal drama in an evocation of pure, unfiltered human emotion. Not merely as a comforting and ultimately passive solace against an unforgiving world but rather as a reawakening of inner strength, a battle cry for souls too long in dormancy. On this split, the works of Infamous also invoke a greater sense of movement than those of the tracks presented by Gorennje. Also, I am sure we all hear the Graveland influence, particularly on the intro. 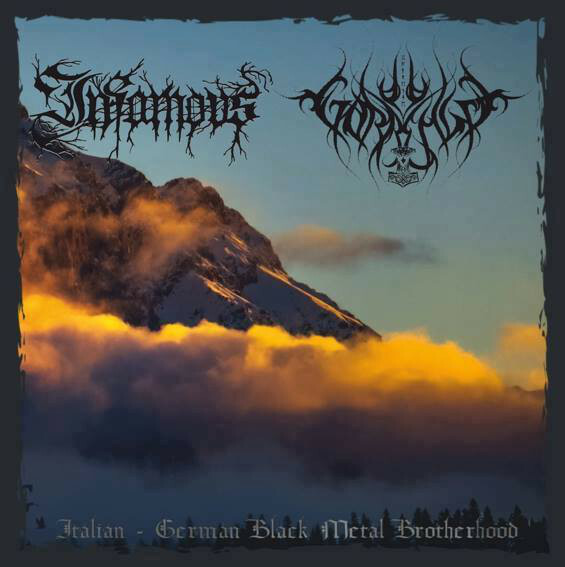 Apparently, there is a split entitled “Hammer of Triumph” that is being released sometime soon with 2 new songs by Infamous and one by the heavy metal band Cromlech in the near future. Will be nice to hear some new Infamous! Very much looking forward to the CROMLECH/INFAMOUS-split as well — hopefully the pairing will spark a synergetic effect.